Just when you think things couldn’t be more upside down, Hillary Clinton declares that only one side is to blame for the vast cultural divide in America. It’s a relief to know that the Democratic standard bearer from 2016 still thinks there is such a thing as a “norm” other than the name of the guy at the Cheers bar in Boston. So, which side has been “debasing norms?” The progressive movement has radically redefined marriage, made gender a state of mind while ignoring biology, turned preference for English as a unifying common language into a mark of bigotry, and worked to make socialism instead of market capitalism the driving force in the economy. Which side wants to flood the nation with millions of illegal immigrants and then deploy multiculturalism to supersede American traditions? Which side calls for complete government seizure of health care, “free” college tuition, confiscatory taxation and redistribution and the ongoing normalization of obscenity and even late-term abortion? As far as “demonizing,” no one can hold a candle to progressives, who play the “hate” and “racist” card over the slightest disagreement. The Left’s Antifa movement is Exhibit A. Ostensibly formed to fight fascism, Antifa is the closest thing to fascist brownshirts that we have in America, with black-masked mobs violently shutting down conservative speakers and whipping up murderous resentment against police officers. “Hyperpolarization now extends beyond politics into nearly every part of our culture,” Mrs. Clinton laments. Well, who might bear the most responsibility? Leftist strategist Saul Alinsky, whom she lauded in her Wellesley College thesis, advised in his “Rules for Radicals” book to “pick the target, freeze it, personalize it, and polarize it.” Democrats are following that to the letter in the Brett Kavanaugh nomination battle. 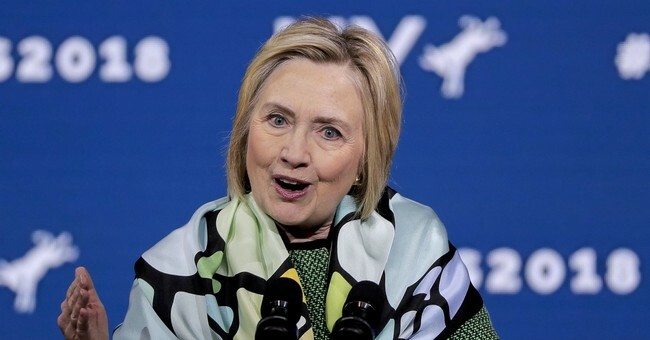 Hillary goes on to accuse the Trump Administration of “incompetence” and that “our democratic institutions and traditions are under siege.” Traditions? Like turning Supreme Court nominee hearings into star chambers? For eight years, the Obama administration and its allies engaged in constant race-baiting, including lectures from Attorney General Eric Holder, who opined that Americans didn’t talk enough about race and who let the New Black Panthers get away with voter intimidation. Far from healing America’s racial divisions, the Obama administration made them much worse. Right. The Rev. Martin Luther King Jr. marched to make sure Corporal Klinger would someday serve comfortably in the frock of his choice and that we have no control over who enters the country. She’s right about that. “Deplorables” need to go to the polls in great numbers to deny the Left its projected final victory over American restoration.